Holika Dahan 2019 is being celebrated today. Holi is one of the most anticipated festivals in the country as it sees a rising and continuous enthusiasm for playing with water and colours. 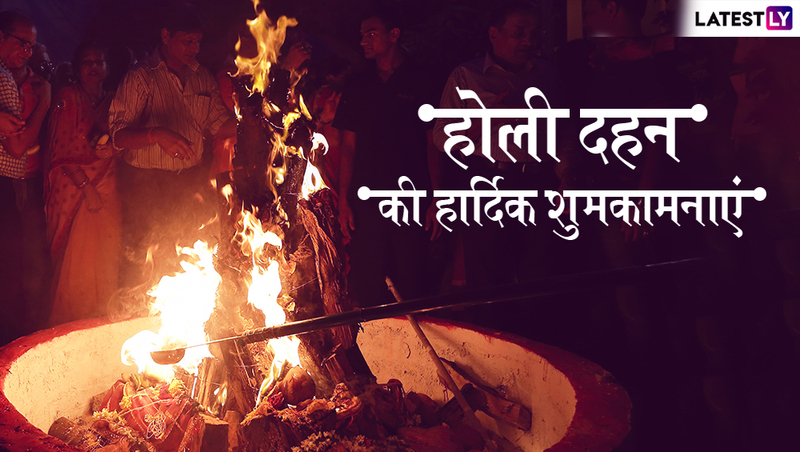 The festival of Holika Dahan symbolises the victory of good over evil. The burning of the holy pyre is symbolic of burning all the bad things, bad deeds and starting with the good again. People wish each other for Holika Dahan and Holika Dahan messages and greetings are exchanged among everyone. If you too are looking for Holi messages, greetings and Holika Dahan images and pictures let us help you out. 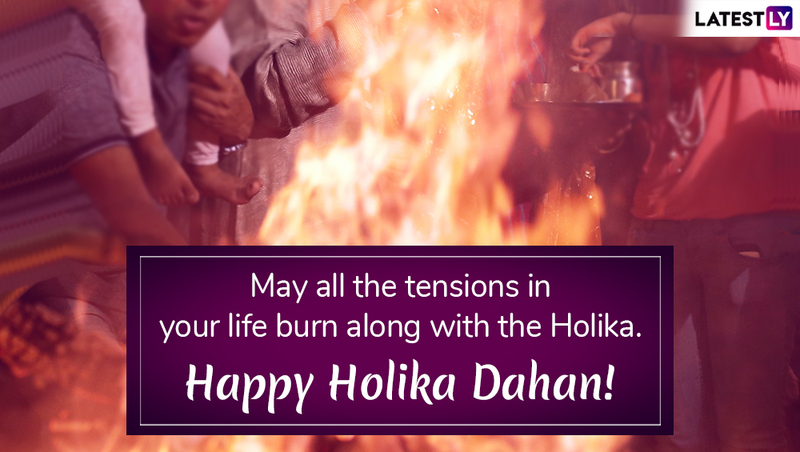 We give you a collection of Holika Dahan messages and greetings, WhatsApp stickers, GIFs and images that you can exchange among your friends and family. Holika Dahan 2019 Date and Time: Know Shubh Muhurat and Puja Vidhi of Chhoti Holi. Holika Dahan is the night before playing Holi, which will be celebrated tomorrow, March 21. 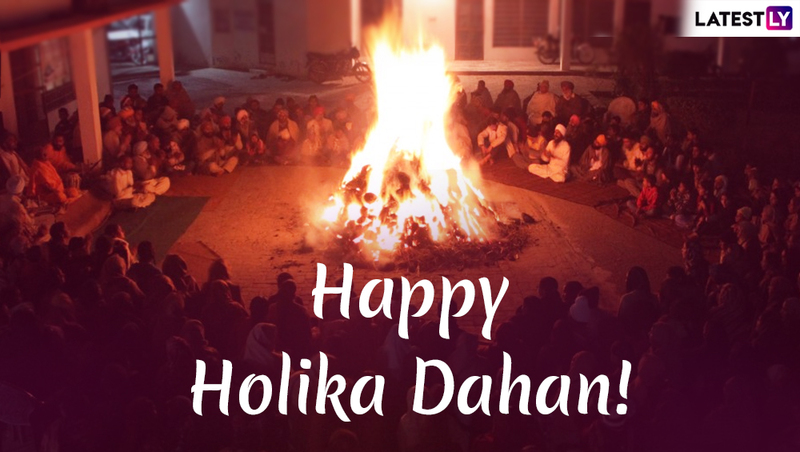 Holika Dahan means 'burning of the demon Holika.' People come together and celebrate this day with great enthusiasm. As per the mythology, Holika Dahan celebrates the killing of Holika by Vishnu in order to save Prahlad, a devotee of God Vishnu; this is how the day gets its name. 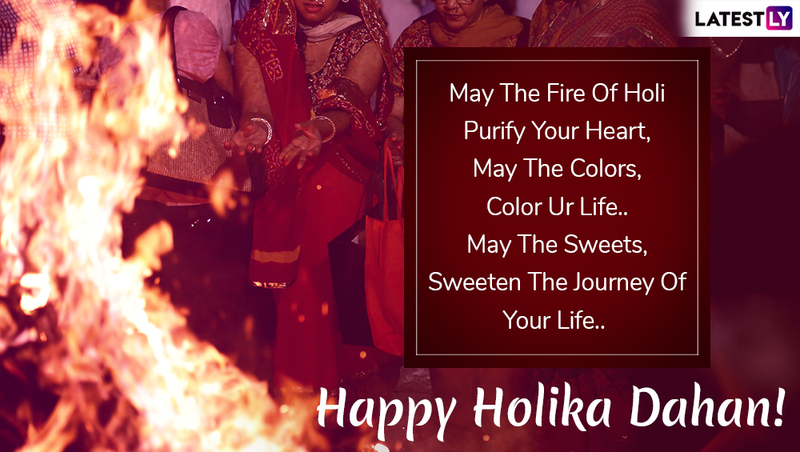 Holika Dahan Images & HD Wallpapers for Free Download Online: Wish Happy Holi 2019 With WhatsApp Stickers & Beautiful GIF Greeting Messages. Message reads: Holi Dahan Ki Hardik Shubhkamnayein! Message reads: May all the tensions in your life burn along with the Holika. happy Holika Dahan! Message reads: Holika Dahan Ki Hardik Shubhkamnayein! Message reads: May the fire of Holi purify your heart, May the Colours, colour your life, May the sweets sweeten the journey of your life... Happy Holika Dahan! Message reads: Happy Holika Dahan! Message reads: Lets burn all our bad things with Holika Dahan. 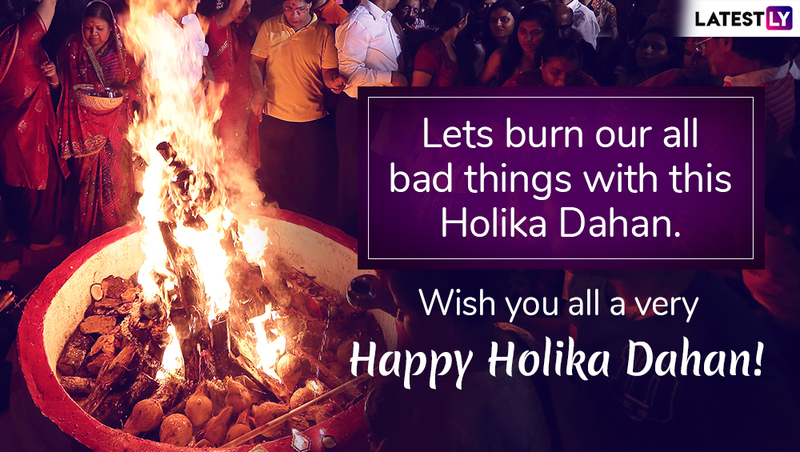 Wish you all a very Happy Holika Dahan! You can download Holi stickers from the PlayStore and then send them through the messaging application. There are many external apps that offer Holi special sticker packs. Download these Holi stickers and send your wishes to your contacts on just the click of a button. We hope the above messages and images help you to send across Happy Holi wishes and greetings. While you celebrate in great enthusiasm, also ensure you play it safe! 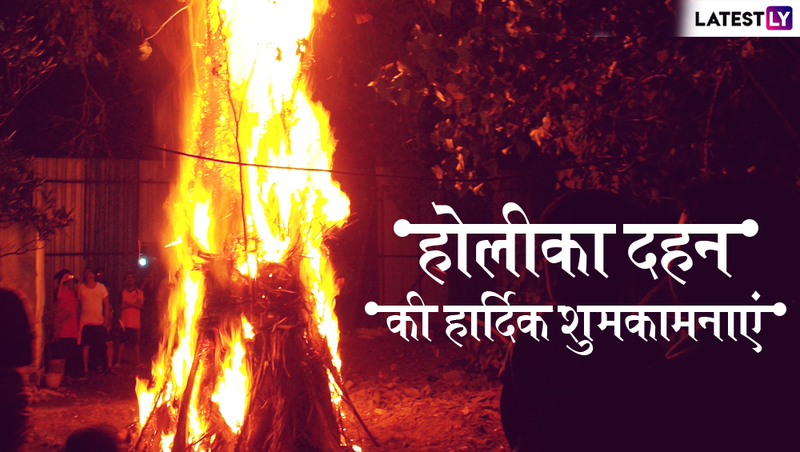 Wish you all a very Happy Holika Dahan!